I'd love to tell you that as a Jalopnik writer, I know the exact price, full engine specs, horsepower, and MPG rating for every single car ever made off the top of my head. Sadly, even I'm not that good. But Google just made my job easier, and yours too if you're buying a new car soon. 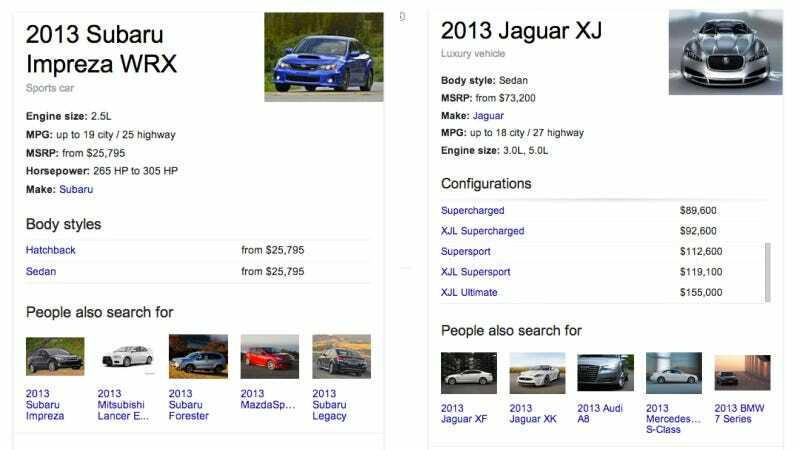 As the website Android Police uncovered today, the Goog recently unveiled a new feature on their search page that pops up pricing data and specs on new cars. It's easy to use: just search for the car you want and the specs come up in a window to the right, along with a list of other cars people search for. The selection of new models seems to be a little spotty too, and it doesn't necessarily follow for the popularity of the vehicle in question. For example, I can see the new info for "2013 Jaguar XJ" and "2013 Nissan Murano," but not "2013 Hyundai Santa Fe" or "2013 Lamborghini Murcielago." Regardless, this is a cool feature, and I hope they add more new and old cars soon. What's the craziest one you can find on Google? What obvious choices are they missing?